Efrem Zimbalist, Sr. was a Russian violinist, composer, conductor, and teacher, born on April 9, 1890 (Brahms was 57 years old.) Zimbalist’s father was a conductor so (not surprisingly) by the age of nine, Efrem was first violin in his father’s orchestra. At age 12 he entered the Saint Petersburg Conservatory to study with Leopold Auer. He is mentioned everywhere as being one of Auer's outstanding pupils - together with Heifetz, Milstein, Elman, and Seidel. He graduated in 1907 and began a long career as a concert violinist, having made his debut in Berlin and London in that same year. 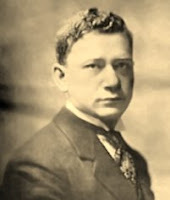 He made his U.S. debut with the Boston Symphony on October 27, 1911. He was 21 years old. According to one source (the New York Times obituary of 2/23/1985), he gave the American premiere of the Glazunov Concerto at that concert. At the time, he even stated that he considered the Glazunov superior to the Tchaikovsky concerto though he may have changed his mind later on. In 1928, Zimbalist began teaching at the Curtis Institute (Philadelphia) and was director of the school from 1941 to 1968. Leopold Auer began teaching at Curtis in the same year - 1928. It has been reported that Zimbalist was very strict, dismissing students who would stray from the school's rules or standards. One such pupil was Joseph Silverstein. Zimbalist actually hired Jascha Heifetz' father (Ruvin Heifetz) to teach at Curtis. Ruvin Heifetz was there one or two years only because, according to Zimbalist, he was "very difficult." I do not know how many recordings Zimbalist made but I’m sure it was not many since he retired from playing in 1949. One such was a recording he did in 1915 with Fritz Kreisler of Bach's Double Concerto with a string quartet accompaniment. A YouTube performance of a Beethoven work, recorded in 1926, is available here. Though he made many recordings of small, short pieces, it is almost certain that he never recorded any major concertos - none that I know about anyway. His interpretation of the Sibelius concerto was praised by none other than Leopold Stokowski. Zimbalist played a 1728 Goffriller, a 1733 Serafin, a 1735 Guarneri, a Guadagnini (GB) from 1775, the Marquis Strad (1718), the Lamoureux Strad (1735), and the Titian Strad (1715) which was at one time owned by the son-in-law of French violinist Pierre Baillot. The Titian is now being played by Cho-Liang Lin. Among his many pupils are Rafael Druian, Eudice Shapiro, Felix Slatkin, Daniel Heifetz, Jascha Brodsky, and Aaron Rosand. Zimbalist's compositions include a violin concerto and an opera, neither of which is now ever performed. Nevertheless, Zimbalist was one of the last great violinist-composers in the tradition of Vivaldi, Tartini, Paganini, Spohr, Viotti, Joachim, Vieuxtemps, Wieniawski, and Markov. He died (in Reno, Nevada) on February 22, 1985, at age 94.
a great man, his son the actor is still going strong at 94.